Just reading ahead and trying to understand the process for the rudder, and can't seem to understand something (probably something basic!). On 7-08 Step 2 we backrivet the R-000904B1 bottom rib and the R-00918 Attach Strip to the right skin. We rivet all rivets along that line, except the forward 4, which is where we will rivet the R-00910 Horn Brace later on page 7-10. Then on 7-10 Step 2, we get to the R-00904A1 Bottom Rib and the other R00918 attach strip. Step 2 has us riveting the aft 8 holes common to both the attach strip and rib/skins. Meaning we leave the aft most hole which is common to ONLY the rib and the skin, and we leave all the forward holes (forward of the 8 indicated). It mentions we may have to peel the trailing edge apart to access the aft 2 holes common to the attach strip, bottom rib and skin. We then use LP4-3 to attach the Left and Right bottom rib together. We then do the horn brace on the lower sides only. We then go back and finish off the horn brace and attach strips to finish the whole line along the bottom, except the aft most hole (as this is common only to the bottom rib and the skins, not the attach strip). 1. What is the reason behind doing the aft 8 rivets first, then going back on the next step to do the rest? I can't see any reason for this unless i am missing something obvious? 2. I can't find anywhere that it later calls out to rivet the last rivet on the left hand side - so i am assuming that i should do it in Step 5 of 7-10 along with all the other rivets in that line. 3. It calls out that we may have to peel apart the trailing edge to access the aft 2 rivets of the attach strip - surely the aft rivet is even harder to set here? (may need a no hole squeezer yoke, or use a MK319BS?). I remember going through these same questions when I built (then scrapped) my rudder. I was hoping to avoid this difficult area when I get to building my second rudder by doing things out of sequence from the plans. I eventually realized the plans are correct. Van's thought this one through pretty well. I don't see any option to what's presented. Here's the reason why. The right skin, bottom rib (R-00904B-1) and attach strip (R-00918) can be riveted together because there is nothing in the build sequence that would hide other locations. The left side is a different story. 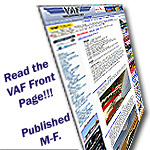 The bottom rib that eventually gets riveted to the right skin (R-00904A-1) is part of the front spar and rudder horn assembly you create on page 7-05. Later on page 7-09 you join the two skins together by riveting the shear clips to stringers without the front spar assembly in place. Then on page 7-10 you place the front spar in position and rivet it to the shear clips and bottom rib. It's at this time you rivet the skin, attach strip and bottom rib together. There's just no reasonable way to get around this sequence I could find. It's a tight area for those last two rivets, but it's possible. I used wood wedges and popsicle sticks to separate the skins for enough room to get clearance for my squeezer yolk. I used a thin nose yolk from Cleaveland Tool that made it easier. Last edited by StressedOut : 07-10-2018 at 07:35 PM. I understand all that, anf thank you for your reply. But why the aft 8 rivets of that rib / attach strip only? Why not just the whole bottom line of them at once? Sorry about that. I reread what I wrote and realized I didn't answer your questions at all. After rereading the plans, I'm stumped too. There doesn't seem to be a reason I can find. The rivet callout is Step 5 on page 7-10. It points you to Figure 2 on page 7-12 with all the specific fastener types. It is hard and it is unavoidable. Refer back to my original answer for details. The thin nose yolk does help. In fact, this part of the build is what convinced me to spend the money to get that yolk. Hope this is a better answer than my first reply. Good luck and don't scrap your rudder like me! 1) You will appreciate the additional access to the R-00910 Horn Brace that is offered when the forward 8 eight holes on the R-00918 Attach Strip are left open. BTW, a longeron yoke is great for the AN470AD4-6s. 2) Step 5 calls out that you should rivet the remaining holes in the lower edge of the skins common to the attach strips and horn brace. I take that to mean "skins to common to the attach strips" and "skins common to the horn brace". 3. Yes. That guy can be tough. I have a no hole yoke that I ground down for even tighter access. Here's that no hole yoke being used differently (in preparation for use to dimple the aft-most holes on the attach strips for the R-911 Rudder Bottom Fairing: male dimple die, female pull die and washer). In that picture below, you can see where I ground it down to fit into really tight spots. It should be clear how it can easily handle those aft rivets on the attach strip in Section 9 and later when you need to rivet the nutplates for the R-911 Rudder Bottom Fairing on page 12-02. All of the posts detailing my first attempt at the rudder can be found here. I messed up the trailing edge as shown below (the rudder has its forward edge down on the table, so you're looking down the trailing edge). So 3.5 years later and with exactly 2,208.8 hours of experience under my belt, I built a second rudder (a whole lot quicker than the first one). It came out perfect. It's amazing what experience can produce. Last edited by RV-14E : 07-11-2018 at 12:50 AM. Fair enough! The attach strips don’t actually cross over with the rudder horn brace, so I still can’t see why you could just do them all. Must be some reason I’m missing! 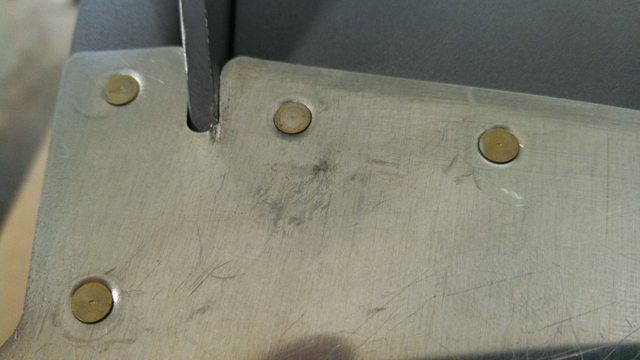 Agree to the “common to” - but that leave a stray -3 rivet at the trailing edge - there seems to be one hole between the end of the attach strip and the trailing edge. Did anyone else have interference issues between one of the LP4 rivets which connect the 2 bottom ribs and the rudder horn brace? I’m wondering if I need to relieve the brace a little but not sure how much is safe. Last edited by TASEsq : 07-11-2018 at 07:01 AM. My apologies! I was wrong on question 1. I had in my mind a different setup. 1. I don't think it has to do with access to the rudder horn. I don't know why those 8 rivets are bucked/squeezed until after the LP4-3s are pulled and the R-00910 Horn Brace is locked down too. Perhaps it's related to promoting the R-00904A-1 Bottom Rib to better line up with the R-00904B-1 Bottom Rib and R-00910 Horn Brace prior to locking things down? 2. I see now what you're referring to. I don't see where in the plans that rivet between the trailing edge and the attach strip is placed. It certainly should not be done prior to 7-10, Step 2. With respect to the LP4-3 next to that flange of the R-00910 Horn Brace, it's tight in there. But those LP4-3 are really flat. I took a picture of that area on my "surplus" rudder to show you what it looks like. BTW, I believe "LP" stands for "low profile". I believe they are manufactured by Avex. One thing to watch out for is at the skin and Horn Brace. Make sure it fits well in there. This is what can happen if it doesn't. I had to address that potentiality prior to assembly on my first rudder, but not my second. Image below by HeliCooper. Last edited by RV-14E : 07-11-2018 at 10:02 AM. I will snip the mandrel off a LP4 rivet and pop it in the hole and check I won’t have any issues layer. I finished my Rudder a few weeks ago and asked the very same question ( search for previous posts ) I did as the plans and ask and ended up with that last hole which is nigh on impossible to rivet well. So I drilled out all rivets required to allow me to peal open TE and then set the last 9 holes. You can open the TE just enough to get the yoke of the squeezer in and set the last 3 rivets. An extra pair of hands comes in handy. Let me give you a word of warning on drilling the TE support angle. I did the same thing on my rudder, albeit with a steel rectangular tube instead of a 90 degree aluminum angle. I used the TE as a drill guide to match drill the holes in the steel and in the process I ruined each and every hole in the TE. All of them were figure eight shape that I didn't catch until I was riveting the TE together. I decided to scrap the rudder as it wasn't structurally sound. The hole spacing is 1 inch center to center. Mark it out using the TE as a marking guide, but don't drill thru the TE holes. It'll save you about $450 and a few dozen hours.